We are delighted to have a special guest post for Liz’s Nag Panchami Film Fesssstival by BollyWhat’s resident snake fancier, jenni. 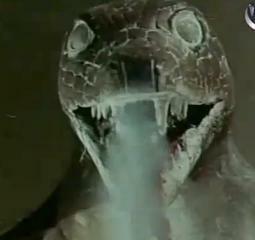 If you have ever seen the film Nagin (1976) you will know what I mean. That is, that you are really much better off if you can identify a vengeful snake, before you are…well….dead. If only they had been able to access my handy Snake Spotter’s Field Guide. In this guide we will illustrate only a small sample of the many hundreds of filmi snake species featured in subcontinental movies, but sufficient, we hope, to show enough of those commonly spotted varieties, and a selection of rarities, to satisfy the beginner and excite the specialist. We have concentrated on snakes that are hardy enough to have tolerated subtitling and You Tube exposure. The filmi snakes in this Guide are restricted to the DVD and VCD habitats. Those filmi snakes only found on videotape and 18mm film are extremely rare and outside the scope of this particular guide. Indeed, VCD snakes are often difficult to glimpse and are dwindling in numbers to the extent that some may even be endangered. This is due to years of neglect and the gradual encroachment upon, and degradation of, their natural environment. The following observations are based on extensive work in the field and hours of YouTube research. Although scientific validation has been undertaken through consultation with both acknowledged experts and enthusiastic amateurs in the area, hypotheses are always subject to revision with an expanded evidence base. It is a simple case of frequency. The more of the following identifying characteristics present in any film, the more likely you are to have bagged yourself a filmi snake! Most important filmi snakes are female. Male filmi snakes are generally underrepresented and play a comparatively small role in the proceedings. If the actor is an item girl (or even an actor who has repeatedly appeared in item numbers), the likelihood of that person being a snake is increased. It is particularly the case in post 70’s movies, that more of a ‘reverse proportionate’ factor in clothing increases the likelihood of the wearer of said clothing being a snake. i.e. the less, and more skanky, the clothing the more likely the wearer is to be a snake. This appears to be a rapidly developing characteristic of the filmi snake, likely a genetic evolutionary response set in motion to impede the threat of extinction. (i) Female: Body hugging attire is generally favoured by filmi snakes, therefore traditional south Indian sari tying styles or short half saris are often seen. In more western style garb they are not averse to a body suit. 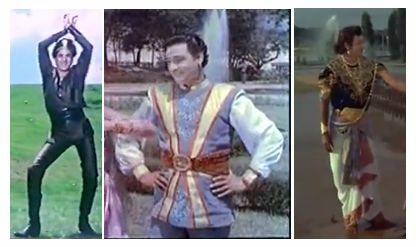 (ii) Male: Fairy tale princely garb often involving some kind of tunic, puffy shirt or ruffles are often found in the male of the species in the north of the subcontinent. Southern males appear to prefer the body hugging styles of their female counterparts. Snakes are, by and large, nicely accessorised. In human form one has to forego scales which have a natural glitter and sheen, and frequent attempts are made by filmi snakes to replicate this characteristic. This is generally achieved with either metallic fabric, or substantial amounts of jewellery. (i) Everyday Use Headdress: a more subtle form (although still often elaborate from a human perspective) often daywear, frequently features a simple cobra head, usually in gold (often a give-away this one). (ii) Big Night Out or Ceremonial Headgear. Most snakes appear to have elaborate and bejewelled headwear for special occasions. (iii) Confrontational Headgear: Even more elaborate and intimidating than ceremonial headgear. As in their reptilian form, (e.g. cobra hood), this serves to make them appear more impressive and sexually desirable, more commanding and important, or just more threatening. a. The more eyeliner that is worn, the more likely that the wearer of said eyeliner is in fact a snake. 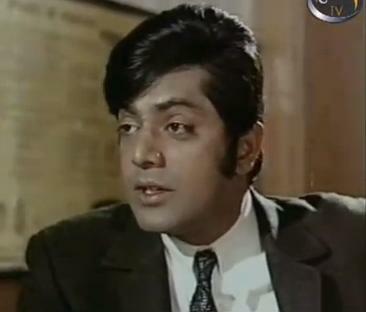 Heavy application of eyeliner cannot be underestimated as a hot spot indicator for the filmi snake spotting novice. b. Coloured contact lenses are currently popular in the filmi snake community. There appears to be an evolutionary factor to this characteristic, in that the widespread availability of coloured contact lenses has only occurred since the mid 1980’s. c. The “I am a snake experiencing murderous thoughts and I mean business” Look. Often, The Look will be highlighted with a lurid coloured camera lens filter for extra impact. Sadly, if you are only recognising the snake at this point, you do not have much longer to live. However, if you can identify this look when it is directed at others you still have a chance, not only of accurate filmi snake identification, but to execute a hasty exit. a. If the said scantily dressed woman is out late at night in an isolated and often forested place, there is an increased chance that she is a snake. b. 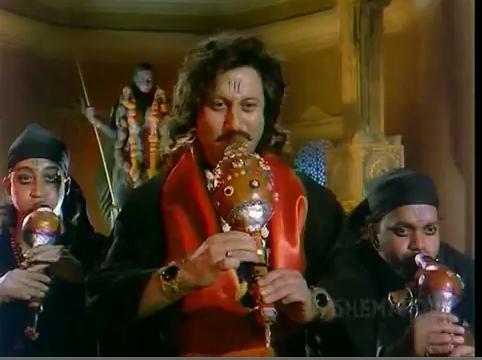 If there is a snake charmer/holy man present with a bedazzled snake charmer’s pipe (been), it is likely that a filmi snake is nearby. If said snake pipe is being played, the chance a snake is likely to be revealed soon, is high (see Sound). 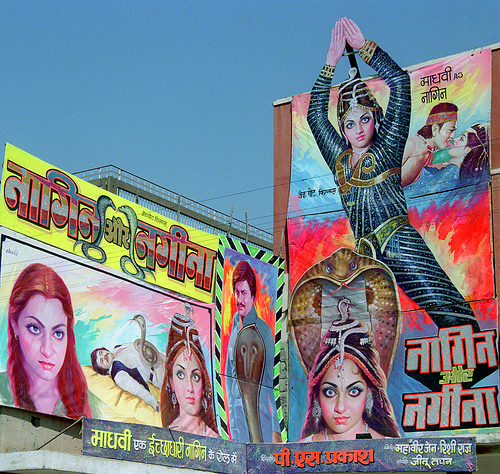 c. Actual snakes or snake houses in the frame increase the likelihood of a genuine filmi snake sighting. d. Likewise, an environment filled with snake statues is generally a dead giveaway. 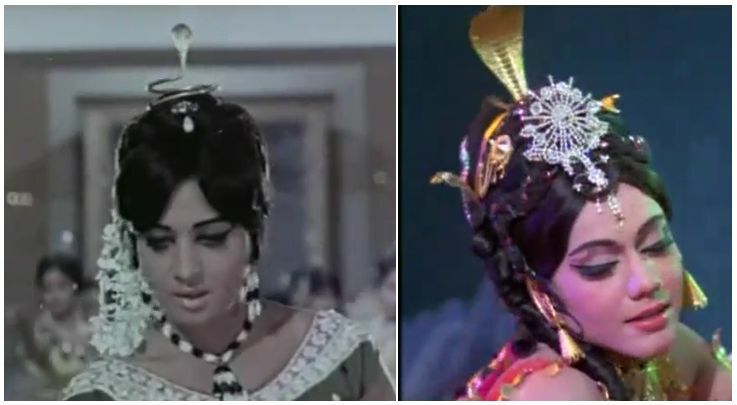 e. (i) The Jeetendra Effect 1 – Jeetendra Proper: For reasons unknown Jeteendra’s presence in any film increases the chance of an appearance by a filmi snake. 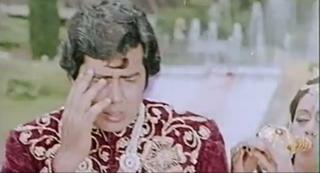 (ii) The Jeetendra Effect 2 – Munchausen’s Jeetendra: Sometimes even a Jeetendra look alike will serve this function (e.g. Naag Muni). Snake music appears to serve a number of functions and consequently has a complex relationship with the snakes themselves. Essentially, snake music can provide a state of ecstatic release and abandon for the snake while in human form, through the medium of dance, albeit only briefly (for more on Snake Dancing see Activity, part b). Whilst initially snake music can liberate the snake from the confines of the human form, if this state is maintained for too long, or with sufficient intensity, all vestiges of the human state will be shed and the snake will revert to their inner reptilian nature and eventually, their reptilian form. 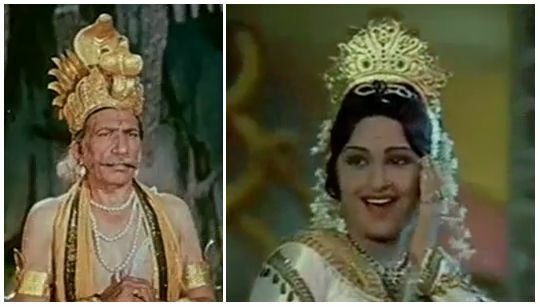 Reaction to snake music is not always helpful in discriminating filmi snakes from filmi humans in that both snakes and humans will typically experience strong reactions. It is the underlying reason for the reactivity, however, that is the singular determinant in accurate identification. Snake music is often cacophonous to human hearing so they will often cover their ears as a deterrent to an adverse auditory stimulus. Snakes however, though they might also attempt to mitigate the auditory stimulus, have an adverse reaction only because the snake music in the presence of humans renders their camouflage ineffective and therefore exposes them to increased environmental threat. This is because, as previously mentioned, prolonged exposure, particularly at the hands of a trained professional (i.e. sadhu or another snake), can force any snake in human form back to its reptilian state. Despite the complexities of the interaction between snakes and their music, for the purpose of snake identification the following is a given: If there is snake music, there are generally snakes. a. 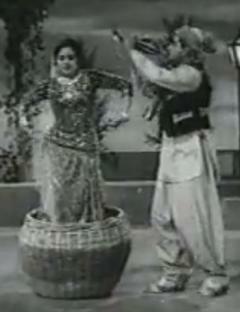 A snake orchestra usually indicates that filmi snakes are nearby. Snake devotees rather than the snakes themselves perform a number of snake dances. These can generally be distinguished by their comparative lack of eyeliner and relatively modest attire. For the beginner, an oft-made mistake is the misidentification of women emerging from wicker baskets being real snakes. Although snakes in their reptile form will often perform for human audiences in a wicker basket under contract to snake charmers, snakes in human form will generally not, and if they do, it is usually only as a ruse. The tradition of women emerging from wicker baskets draws heavily upon both snake myth and stereotype. These snake charlatans are generally involved in the entertainment industry and bear nothing more than a passing resemblance to the real filmi snake. At most this is a symbolic plot device to illustrate an underlying jealous or vengeful nature on the part of the character. Otherwise known as the Snakeus Imposterus or, more commonly, Fake Snake. Snakes love dancing. Genuine snake dancing most commonly can be categorised into five major categories (there are also minor categories beyond the scope of this guide). An illustrative example for each category is provided. 1. Discovering Your Inner Snaky Nature dance. When snakes have been reared with humans, they are sometimes unaware of their inner reptilian nature. Snake music at maturity will allow these naïve snakes to touch their inner nature and sexuality, eliciting both a sense of freedom and power, sometimes conflicted with a great deal of associated confusion and fear (similar in some ways to the experience of human adolescence). Can take the form of either an anticipatory mating/attracting the mate or an actual mating dance with the partner. Either undertaken in royal snake courts, temples, or (usually in snake form) in conjunction with snake charmers for mostly human audiences. This dance has the sole purpose of attracting prey (this skilled re-enactment rather than actual footage is provided for illustrative purposes, given that the actual dance is rarely witnessed – at least by someone who lives to show the video evidence). May occur when the snake is directly under threat and may involve transformations from human, to reptilian nature revealed but still in human form, to entirely reptilian form. The previous are general guidelines, and for every guideline there is an exception. Snake spotting can be a dangerous activity so it is best to always maintain a state of being alert (though not alarmed). It is hoped that this guide enhances both the accuracy and safety of your Sssnake Ssspotting experience. This entry was posted in Academy of Applied Filmi Snake Research and Ethics, Bollywood, Kollywood, Tollywood and tagged Academy of Applied Filmi Snake Research and Ethics, been music, Chiranjeevi, Chiru, How to spot a filmi snake, Jeetendra, naag, Naag films, Nag Panchami Film Fesssstival, nagfilmfest, nagin, Nagin films, Reena Roy, Sri Devi, the Jeetendra effect, too much snake music. Bookmark the permalink. Wow! That’s really impressing guide! BRAVO JENNI!!!!! Evocative, hilarious, and sure to be extremely useful! I cannot wait to analyze my own snake-spotting experiences in light of your diligent scholarly research! Thank you Beth. I hope that you are able to provide some follow up observational field data. Contributions to this sadly neglected, under funded and under-researched scientific filmi sub-genre are highly sought after and valued. The awareness raising efforts of people such as Liz for organising this fesssstival must be acknowledged and applauded. This is possibly the greatest thing I have ever read. Oh my, this guide has exceeded my wildest hopes of what might be accomplished during the film fesssssst. It’s so helpful to know that I can safely indulge in my pastime of watching women dance in baskets, and that recreations of the hunting dance will be rewarded with silver trophies. Ok. Re women in baskets. There are occasional exceptions to the rule but by and large you should be safe (if you are in the vicinity of a woman emerging from a wicker basket check the eyeliner coverage just to be sure she is in fact a Fake Snake). I like to recreate the hunting dance in the privacy of my own home. Especially the finger wiggling near the eyes move with ‘The Look’ (6 degrees of difficulty). You can use whoever is present in your home at the time as your imaginary prey. Perhaps as a disciplinary measure for misbehaving children and/or animals? Very gratifying in and of itself I find. Wow! Your most scholarly analysis deserves to be published as an academic paper!! Well researched and well-written, it is an example to follow for would-be Bollywood guide books. Well done! I’ve been pondering 4b (the light colored eyes/fake contacts.) Actual Indian cobras’ eyes are not particularly lighter than human eyes (http://wallpapers.net/view/indian_cobra-normal.html and http://en.wikipedia.org/wiki/File:Indiancobra.jpg), and from a safe distance they seem fairly dark. I’m intrigued how the light eyes actually became associated with snakes. Perhaps it’s just product placement from the colored contact lens industry. You make an interesting observation. My understanding is that the transformative process from snake to human is physiologically demanding. One of the potential side effects is the draining of pigment from the eyeballs. This is partially evolutionary given that filmi snakes, unlike real snakes, tend to appear more frequently at night than during the day. Therefore, eyes are not subjected to long periods of exposure to sunlight, so protective pigment is not such an important biological imperative. Thus the energy can be safely diverted from colouring the iris into the parts of the brain activated during the metamorphosis. Or indeed, as you suggest as an alternative hypothesis, possibly optometry product placement. Of course- mutation and adaptation for the nocturnal lifestyle of filmi snakes now seems so obvious! Bravo indeed! Had me in splits throughout. 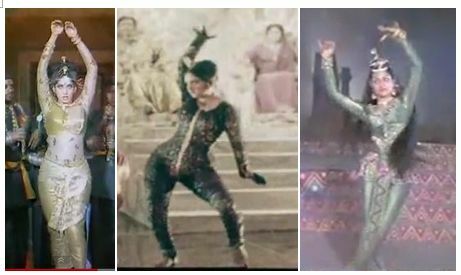 The Jeetendra effect -> bwahahaha. So true, now that I think about it. The most useful review on calacitrik Naginis I read so far! Spellboundly and fatally I fell in Love each and every aspect of naginity you so profoundly illustrated.